The green shed is like the Tardis from Doctor Who. There is more happening here than I can imagine. I thought I had entered the modest grounds of a nursery. A jazz band is playing as I peek into the first room, the audience being thirty senior citizens. In a small room, to my side, full of CDs, a group is in animated discussion. There is a buzz in this place - a buzz that makes me curious. “Welcome to the Victorian Jazz Archive,” says Margaret. “Do you want to have a tour?” Margaret Cleaver is a firm woman, in her seventies, neatly dressed and amicable. I am a bit taken aback. I introduce myself; explain how I would like to write a story on the place. I am ushered into a side room and perch myself on a table. Press clippings of jazz articles lie neatly to my side. Book cases of jazz books and videos surround me. A storage cabinet, called the ‘Bill Miller collection,’ lies to one side of the room. Sounds of a jazz band – the New Melbourne Jazz Band - filter from the next room. A few people type away on computer keyboards to my side. Three shipping containers, or 'vaults' as they are called, signal a strong presence within the building. There is an atmosphere of conviviality – warmth. I am a guest and there is a sense of pride within the establishment. A man walks into the room and puts a box on the table. He pulls out a wad of magazines. They are ‘Downbeat’ magazines, dating back to 1937. They have just been left to the archive. In a long room, to the side of one of the vaults, two men work away on computers. Mel Forbes is entering details of recently acquired jazz journals. Margaret takes me to the end of this room. She opens a drawer. “These are our posters,” she says. I see the words “Camberwell Town Hall.” It is an advert for the Max Collie band – a gig from the 1950s. I converse with Gretel, a friendly lady in her seventies. She has worked here for eight years and writes the newsletter. “They picked me up after I finished working on the newsletter for the Victorian Jazz Club,” she says. I am joined by Barrie Boyes, a retired office manager with a computing background who has been with the archive for two years. We discuss the value that volunteers get out of the archive. ”There's lots of widows and widowers here,” says Barrie. What becomes apparent is the hold of this place. It not only concerns itself with the archiving of jazz memorabilia but also provides a meaningful workspace. “You bring your experience to this place,” says Sharon Bartley. She has a background in finance and has answered a job volunteer advert in a newspaper. band members and the clues that they give.The sounds of the jazz band filter into the room. Clapping can be heard intermittently. The Victorian Jazz Archive is a most intriguing archive. Situated in Koomba Park, Wantirna an outer suburb of Melbourne, Australia, it was first established in 1996, when a need was identified to collect and archive Australian jazz material, specifically in Victoria. The not-for-profit incorporated association preserves Australian jazz music and memorabilia. It holds over 15,000 items in the Australian Jazz Collection — the Eastern Regional libraries providing a website link to the collection. Access is provided to students, researchers and members of the general public. The VJA is recognized, by the National Film and Sound Archive, as a national distributor of audio visual material. I visit the exhibition space, the Ray Marginson Library, named after Dr. Ray Marginson AM, the founding president. It doubles as a library and display space - exhibitions rotating every six months. 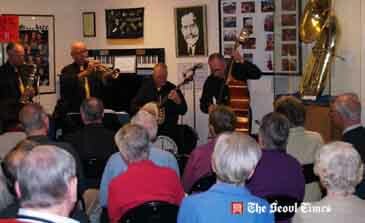 Instruments, recordings and the history of the New Melbourne Jazz Band are currently featured. Ironically this band has just finished playing. Sandwiches, cakes and tea and coffee are being served to the visiting Dingley Central Probus Club, each member having paid $10 for a tour, performance and refreshments. Pat Pocknee, a Probus member, and member of the archive, informs me of how she loves these visits, how something interesting happens each time. She remembers one performance in which a man, one side paralyzed by a stroke, played a piano duet. “It was very moving,” she says. A few days later I meet Mel Blachford, the Collections Manager. He is an eager man, in his late sixties, keen to inform me of the complex role played by the archive. Another social group is visiting the archive, and the sound of a jazz band filters throughout the rooms. It is a Friday; the archive is open to the public on Tuesdays and Fridays. events, made onto aluminum discs, for broadcast by radio stations. Australian jazz musicians. Most have been transferred from audio tape onto carefully stored and expensive archival CDs. The second vault, specializing in printed materials, contains rare books, jazz magazines and sheet music. There are over 1000 jazz books and periodicals held at the archive. “These are Roger Bell’s compositions and notations,” says Mel, opening a cabinet. I look at a handwritten composition. It is called The Devil bends his elbow. “Great title,” says Mel. Roger Bell, a famous Australian jazz musician, and brother of Graeme Bell, died in 2008, part of his jazz estate coming to the archive. The third vault contains material related to the Australian Jazz Convention, an annual event, dating back to 1947, and the longest running jazz festival in the world. “Have a look at this,” Mel whispers, taking me into the back of another room. unusual alto sax by the Grafton Saxophone Company. He was in esteemed company, similar saxes were presented to Johnny Dankworth and Charlie Parker. Mel jokes about the items coming into the archive, “I’ve said to people don’t die when I’m around. We don’t have time to do it all.” He confesses that coming years are going to be boom times. A lot of jazz enthusiasts, including players, are in their twilight years. am intrigued by photos of the Palais Theatre, in St Kilda - days when it was a dancehall in the 1930s. “They probably don’t even have these photos,” says Mel. He pulls out a collection of records. “These are bootlegs made by Bill Miller,” he says. “He made up names so you didn't know the artist, but could guess.” I see pirated copies of American recordings. “Great titles,” says Mel. One is called ‘Countin’ the Blues’, by ‘Mama Can Can and Orphan Will’. It is a bootleg of Louis Armstrong and Ma Rainey. “All sorts of people get in contact with us.” He mentions a writer - Kay Dreyfus. She has written a book 'Sweethearts of Rhythm: the Story of Australia's all-girl bands and orchestras to the end of the Second World War'. The research notes and interview tapes for this book have been left to the archive. cancer in 2008, would donate, without question, each year’s company director’s fee. What becomes apparent, as I move through the building, is the extraordinary dedication of the volunteers. 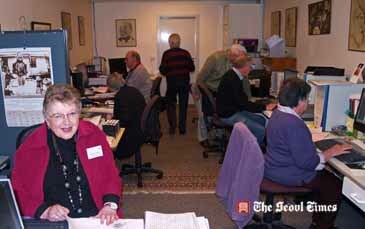 The website states that 54 volunteers, during 2008, dedicated over 13,000 hours of time to the archive. This is an archive of memorabilia as well as human effort! Japanese musician visiting here shortly,” he says. In the corner of the room Gretel James is continuing to type away. “This has recently come in,” she says. It is the diary of Roger Bell’s 1947 trip to Czechoslovakia. It will be an interesting read. Roger and Graeme Bell - the Bell Band- sponsored through connections made by the Eureka Youth League, previously the Young Communist League, made a four month celebrated tour of the young jazz starved Communist country in 1947.
digitally recorded and mixed. Old recordings are carefully brought back to life. My visit concludes in a small canteen- the Waterfront Cafe. People are helping themselves to tea and coffee, plates are being brought in from the gallery where a tour group is being hosted. I meet with Jeff Blades, a committee member, and a man in his seventies. He has a walking cane, and can only speak to me briefly as he has a medical appointment. He is keen that I represent the huge voluntary effort put in by individuals. We sit at a table under a large 1964 photo of the band called ‘Frank Traynor and the Jazz Preachers’. It includes a young Smacka Fitzgibbon, a legendary Australian jazz entertainer. He alludes to the friendship amongst peers, how this is echoed by friends meeting up again at this archive - this time being in their sixties, seventies, or eighties. One story relates to an old record store in Melbourne – ‘Bob Clemens Records’. When it closed a lot of the material from the store ended up in a skip in a Melbourne lane. It was rescued by a fellow across the road. These stories go to the heart of what this archive does- keeping a tradition alive by the very rescue and preservation of old material. The idea is powerful. It goes very much to the heart of archiving and what is being done in this modest suburban shed. What we deem as important is often made important by the efforts of volunteers- people who spend countless hours collecting and cataloguing. On my next short visit I discuss, with Peter Edwards, the Print Manager, how reel to reel tapes can be brought back to life- of all things- by baking them slowly in an oven! I leaf through a scrapbook. It details a friendship, in the 1960s, between Louis Armstrong and his wife, and a couple, who lived - of all places- in Moorabbin. I wonder what other gems are being contributed, preserved and catalogued in this surprising building. I never cease to be amazed. It is open Tuesdays and Fridays from 10- 4 or by appointment. It welcomes tour groups, new members and volunteers. It also welcomes the donation of jazz collections.